Thank you Edwards® Desserts for sponsoring this post. Head to the frozen desserts aisle of your grocery store to pick up your favorite Edwards pie and make entertaining a breeze! The holidays are almost upon us and I’m excited about hosting for the holidays in our new farmhouse style kitchen. 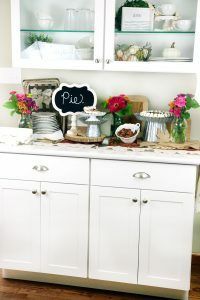 This year, I want to do something special with the new serving area in our kitchen and I’m sharing ‘How to Easily Set Up a Dessert Area with Edwards Desserts for the Holidays’. Sometimes the presentation of an area can take a lot of time to set up, so why not make life a little easier by using Edwards Desserts for all of your holiday pie needs! Plus, read on to find out how you can enter their contest to have a chance to win a limited-edition, dessert-inspired prize pack. You can now share your love for Edwards Desserts on their Facebook page! You’ll have a chance to win a limited-edition, dessert-inspired prize pack. Edwards will select one lucky entrant by throwing a holiday celebration for their town in which they will be the guest of honor, and treating them and their guests of choice to an exclusive dining experience. Click HERE to enter! 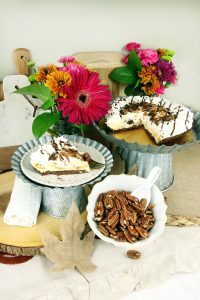 Edwards Desserts makes indulgent, thaw-and-serve crème pies that are found in the frozen desserts aisle of grocery stores nationwide (I found mine at Walmart!). 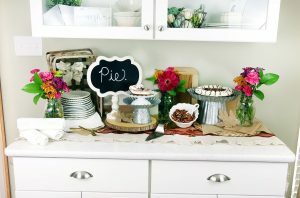 When selecting pies for my dessert table, I went with Edwards® Turtle Pie Crème Pie and Edwards® Hershey’s Chocolate Crème Pie. 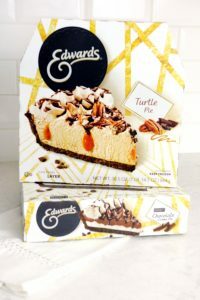 The Edwards® Turtle Pie Crème Pie was my first choice! 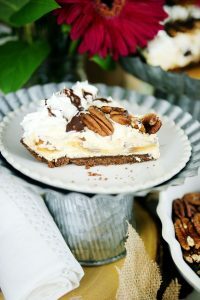 This pie has a smooth caramel filling infused with rich caramel, topped with chocolate, pecans, and whipped crème rosettes on a fresh-from-the-oven chocolate cookie crumb crust. This pie is truly a real show-stopper. You’ll want to take it slow and savor every bite. 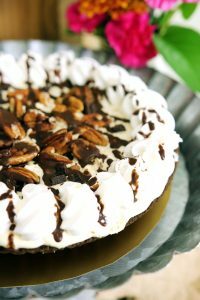 Edwards Hershey’s Chocolate Crème Pie is another great pie for the holidays, because who doesn’t love chocolate? It includes layers of chocolate and vanilla crème topped with chocolate pieces, chocolate drizzle and whipped crème rosettes on a fresh-from-the-oven chocolate cookie crumb crust. 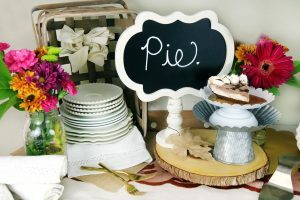 When setting up the dessert station, I used a lot of items I already had around the home. You’ll want items of various heights and different textures. I tried to keep all of the items mostly neutral, except for the pop of color the second table cloth adds and the colors from the Fall flowers. Use Edwards Desserts for a simple yet tasty dessert solution to save time! Remember to check out Edwards Desserts for thaw-and-serve crème pies that are available in whole pie and single-serve portions. Other varieties include Edwards® Key Lime Crème Pie, Edwards® Cookies and Crème Pie and the seasonal Edwards® Pumpkin Crème Pie.